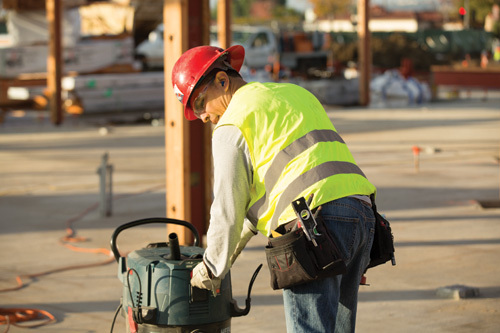 The Bosch VAC140AH 14-Gallon Dust Extractor with Auto Filter Clean and HEPA Filter provides a complete package that is designed to help users move toward compliance with the OSHA silica dust regulation. The dust extractor delivers a maximum 150-cubic-feet-of-air-per-minute rate (CFM), with a sustainable 97 In. static water lift (maximum). The automatic on-board filter-cleaning system activates every 15 seconds to help maintain maximum suction power. The included HEPA filter captures 99.97% of particles at 0.3 microns and larger. The included fleece filter bag helps to protect the filter and provides the optimal containment of dry dust and debris. The dust extractor also has power tool activation that allows the tool to activate the vac and a Power Broker dial to match the suction force to application.